Oh AOL. You’re so pathetic. You don’t even have to say anything. You just ARE pathetic. Sad. Completely backwards. Technologically retarded. you should know it does not make me want to sympathize with you. It really just makes me pity how you’ve managed to squander such potential. You had the entire freaking population eating our of your hand with those dial up CDs. For years, people thought AOL was the internet. But maybe you got a little too comfortable. Maybe you kept pushing dial-up long past the point when it was still useful. And there was backlash. And now your image stinks. (along with your attitude, apparently). So there’s your first problem. Your image. You could figure cold fusion and people would think they’d have to use your crappy dial up service to get to it. Or deal with your abysmal customer service when the reaction didn’t yield as much energy as they’d like. You’ll notice that even in the comments to your post, most people confuse the online mail product with the old AOL Client (now in, for some inexplicable reason, in version 1.5b6 for Mac!). Tough break there. Your second problem is, and has always been, your interface. 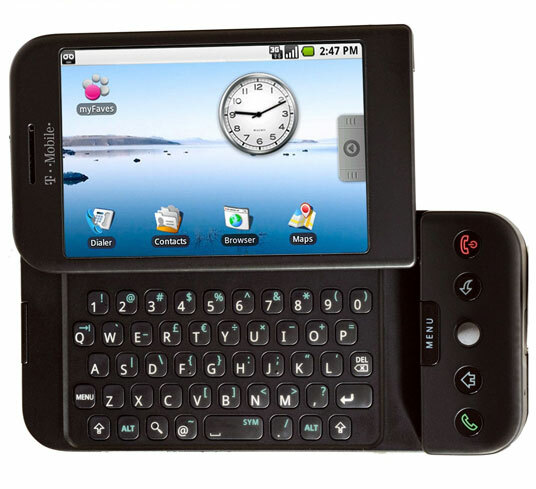 It is pretty much unusable. You could have all the features in the world, and if people can’t find them you might as well not have them in the first place. I used your webmail client back when I worked for you it was very difficult to navigate. Having used GMail for years now and AOL Mail a few years ago with the old interface, I’m not afraid to say: the new interface is a BLATANT RIP-OFF of GMail’s (just like 2 years ago when you ‘redesigned’ your homepage and it ended up looking exactly like Yahoo!). But the core problem is more insidious. In every product of yours that I’ve seen (product, mind you — your AIM service API is actually quite nice) you suffer from feature overload. You throw in the kitchen sink on every product, and enable everything by default. And nobody can find anything. Google’s strategy, by comparison, has always been simplicity: get users used to a new, easily assimilated paradigm with a few twists, then introduce optional complexity. So yes. You could’ve done everything that GMail does way before they did. But I’m a pretty advanced user and I couldn’t find half of the features you’re talking about. I quickly got frustrated and left. In the end, though, what does it matter? You’ve lost. It’s not even a contest. I can’t think of a single one of my friends who still has an aol.com account. Most of them are @gmail.com. You lost this war years ago when a) Google offered its users a truckload of free disk space, b) they started with an invite-only Beta program that made them sound exclusive and c) spent a huge amount of time QAing their code before they released it (another little something you’ve never been very good at). Give us all a call when you want to play with the big kids. After you’ve had some time and think about what it is you think you actually want to be good at, how you can distinguish yourself from your competitors, and why you think we should pay attention to you. Until then, I think you need a time out. Go sit in the corner and think about what you’ve done. I’m sure you’ve heard by now. Google released a new web browser. Chrome. My first reaction to this is one of dismay. Another freaking web browser? What do I need that for? 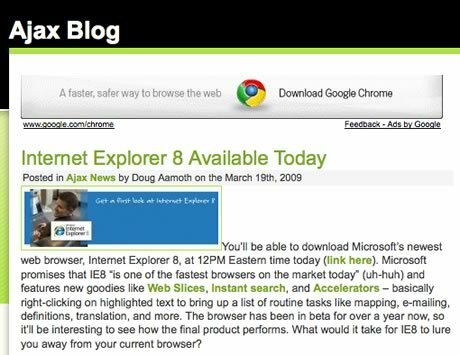 I’m still having to check for bugs in IE6 — a browser that should’ve died years ago. My second is one of anger at Google. I like Firefox. I think Mozilla has a good heart in addition to having a great browser. If Chrome is going to steal market share, it’s most likely going to steal from Firefox — not IE. Most of the people who use IE are either enterprise (and can’t download another browser) or not tech-savvy (don’t know how to download another browser). If they haven’t downloaded a browser besides IE6 (like Firefox, Safari, Opera, etc — they have plenty of choices and they’ve had plenty of time), it’s unlikely they’d download Chrome. So great. Google steals from FF’s market share. And Google paid up on their Mozilla contract till 2011 to keep their bases covered, but if Chrome catches on, I bet you Google will kill that contract. Leaving Mozilla broke with about half of it’s market share poached. What? I know I’m no lawyer, but what that says to me is if ANYONE displays a website in Chrome (ANY website), then Google then has the right to distribute that website, in part or in whole, worldwide. What? How can they claim to have that right? If you’re looking at this site in Chrome now, does that mean Google thinks it’s their right to adapt, modify, publish, display, ‘publicly perform’, etc? My favorite little logical twist is that technically, if you ‘submit’ your credit card # via Chrome, since you’ve agreed to their terms of service, they then have a right to ‘distribute’ it. Now that’s a business model. Stealing credit card numbers on a massive scale and then moving to Switzerland. AND the real kicker is this: Chrome is distributed under the BSD license — which is a particularly open open-source contract. You could logically say that if you submit your credit card number via Chrome that then EVERYONE owns it. Resulting in something less like Switzerland and more like the end of Fight Club. But really, what the BSD license means is that, if you don’t like Google’s terms for Chrome you can download the code in its entirety, take out their logo, recompile it under your own terms and use it however you want. So, kids. It’s time to get those compilers chugging. Who wants to to follow Google’s rules when they can so easily walk right around them. Google looks more and more like Microsoft every day. Throw a few class actions lawsuits at them and the two would be virtually indistinguishable. I really wish I understood patent law better, I must say. But I just read this article and it seems unbelievable to me. If I gleaned this correctly, a shifting of the Patent Office’s position on what technically qualifies for patents basically invalidates software patents. Now that I look around, it seems like this has actually been up for debate for quite some time. Even Wikipedia seems pretty opinionated about the matter. And I guess there is definitely some debate as to whether software should be protected by patents or by copyright. Still. Seems pretty aggressive on the part of the patent office to go after Google. … which seem like they could be applied to pretty much anything! I mean, a mouse is a remote controller with an analog button! And the guy already won $21 million from Nintendo in ‘damages’. Long ago I should’ve patented ‘Flat Surface with Texture’ and sued the entire world. All of that said, I’m all for open source culture. I think it’s a step in the right direction. But when it’s the patent office and the courts that are making the decisions, I find they are generally completely ignorant about most things technical. I’m all for making Google fight harder for their bread. But only if the Patent Office actually knows what they’re doing. 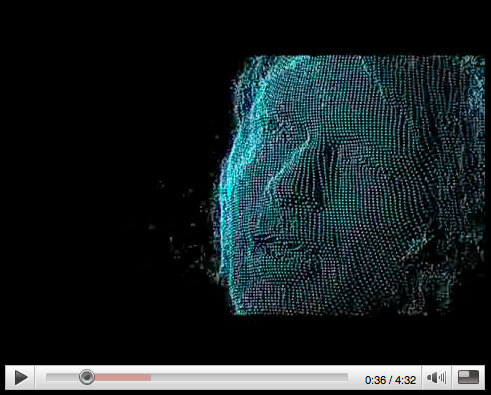 Apparently Radiohead teamed up with Google to do some pretty nifty 3D modeling in the new House of Cards video.